1. What is Super ACiD Block Attack? 2. Wasn't this originally ... ? 4. How long did it take to make? 5. Why was this game made? 6. How do I play this? 7. Are there any cheat codes? 9. How do I submit a high-score? 10. How can I make music like in the game? Yes, Super ACiD Block Attack was originally another game, simply titled ACiD Tetris. The game became very popular for us. 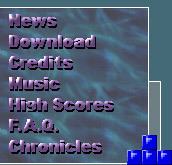 In 1997, if you had entered the word Tetris into any search engine, you would come across our game, either at our homesite or from another download site. We're very accurate when we say the game's popularity came from both the quality of music, and the total size of the game. Being able to fit the game compressed onto a 3 1/2" floppy disk definitely made it a favorite amongst the college crowd. On April 15th, 1999, we received an e-mail from an attorney on behalf of The Tetris Company telling us we had to remove all presence of our game due to infringement on their trademarked Tetris logo. We had made the mistake of using it in the title of our remake. This of course scarred us. Even though we were not selling our game, we were quite young and still fledgelings in our careers, and not wanting a very large lawsuit, didn't want to risk any further exposure on the matter. Now, in 2002, we have re-titled the game, fixed a bug here and there, and re-released the game under the new title, Super ACiD Block Attack. The game environment, which consists of the memory management module, music driver and video driver, was being developed for another game of ours, Axia. Jason needed to do some final debugging and fine-tuning of these engines, and separated them from the Axia game. He also needed a break from Axia, and on a whim one week decided to code the Tetris game in it. Scotty (Windsinger) was in easy contact, so he got him to do the graphics, and even a song for it. Jason contacted all of his musician buddies asking for an un-released song. So within the span of a week, the game was finished. When the game was released and e-mails started coming in with problems here and there (mostly concerning sound), bug fixes were released. Because the programmer likes Tetris. The gameplay is simple, rotate and move the falling blocks to fill in entire rows of blocks. When an entire row is filled, the row disappears, the board shifts downward, and you get points! The more rows cleared at once, the more points! The game will increase in speed as the level increases(for each 10 lines), and the points per line will increase also. You need to set the Compatibility mode to Windows 95. 1. Right click on the saba.exe icon, and select Properties at the bottom of the pop-up. 3. As in the graphic above, check the box "Run this program in compatibility mode for:"
4. Select Windows 95 from the drop-down window. 5. Hit OK, and play the game! Unfortunately, you still may encounter some sound issues under WinXP. We're still working on this ourselves. You will need to send us the file SETUP.DAT from your SABA directory. The file is very small to e-mail, usually around 178 bytes. We use this file to verify the high-score you are submitting. Also, be sure to take a moment to write a little about your game-playing strategy so we may include it with your score! The music was created with programs called Trackers. They're usually free of charge. Explanation of these programs is far beyond the scope of this FAQ, but here are some links to get started into the wonderful world of Tracking.